Scam | Why Dont You Blog? UK psychics are objecting to a change in consumer protection law that would prevent them making misleading claims. (So, that would be ALL their claims, basically.) Until this change, a prosecution could only be brought for deliberate fraud. On the BBC webpage, the public face of the psychics protesting this are the Spiritualist Churches (which survive on the proceeds of the collection box) and “a spiritual healer, shaman and “space clearing consultant” who clearly believes that she provides a genuine service for her fees. Oddly, I’m in two minds about this. It’s not that I don’t think that profiting from telling nonsense to unhappy people is pretty evil. That is almost too obviously true to bother mentioning. I just feel a bit uneasy about criminalising yet another aspect of foolish behaviour. Where do you draw the line? Surely, the more mainstream religions would fall foul of this law. You can hardly prosecute someone for channelling an imaginary dead relative, if you are going to allow other people to claim that their deity will take you into paradise after you are dead. On the positive side, the law might provide me with good grounds for demanding endless prosecutions of the popular press – or, at least, getting out-of-court settlements from them to stop my newly-litigation-hungry self. Quite apart from the fact that the papers make misleading claims about society every day of the week, those daily horoscopes are definitely not matching up with my reality. Note the use of the word “foreign.” You might wonder if that means that our own lovable-cockney-villain mass mailshot fraudsters will be exempt, then. At the risk of being a broken record, I seriously resent the casual fostering of foreigner-hatred that is increasingly passing for public discourse in the UK. So this is an anti-spam law? I am confused. I thought fraud was already a crime, although observers of the higher reaches of the property and banking industries might not see much evidence that this is true. I will take it that this new law implies that internet fraud isn’t actually a crime yet. so I am hurriedly drafting some 419 scam emails, as we speak….. Although, maybe I should just engage the apathy-sketchpad blogger to do my email composition He has one of the funniest examples of scammer-scammed correspondence that I’ve ever seen, complete with web forms he created just to drag the scammmer further and further into his trap. Given the way the UK has got on board this “healthy eating” campaign, it is not surprising that the supermarkets have pulled out all the plugs to use this woo to sell more products. On a fairly regular basis there are adverts on TV how this product or that product is “one of your five a day” with minimal reason behind the claims. 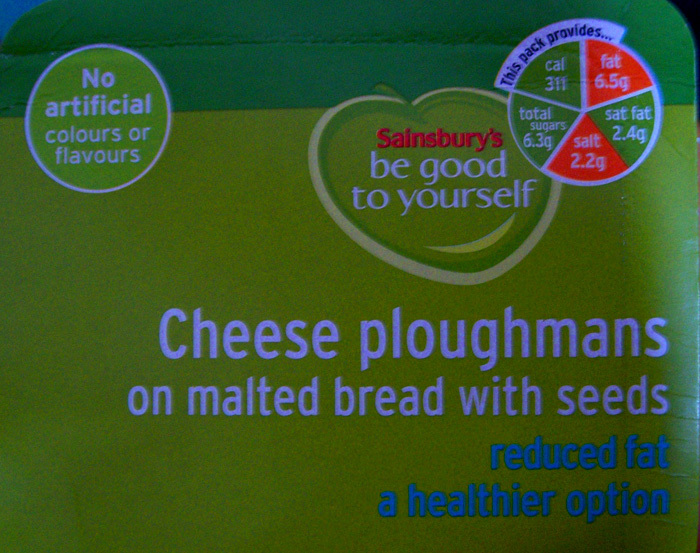 It seems Sainsbury’s (supermarket chain) has joined in and in their infinite wisdom have decided that telling their customers how many grams of fat, carbohydrates/sugar, protein etc., are in their food is not effective. As part of the great dumbing down of the UK they now use a “traffic light” system. It is pretty embarrassing.